Delicious and comforting this chicken and stuffing casserole is a meal in itself but can also be made as part of a big family festive spread. 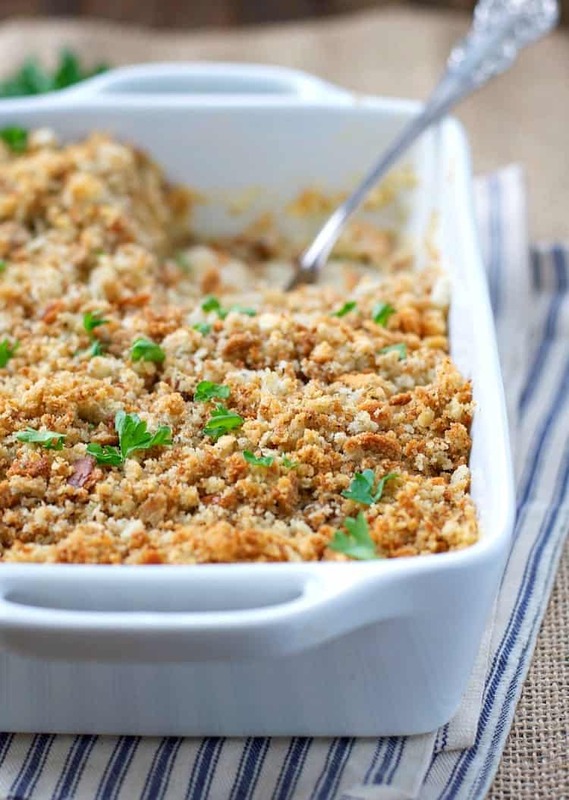 This Chicken and Stuffing Casserole is pure, cool-weather comfort food! It’s easy to prepare, it can be made ahead (and frozen), and it appeals to even the pickiest palates. Happy Friday, folks! Even though we have had some very hot weather in Virginia this week, my mind is jumping ahead to the more temperate fall months. Chicken and Stuffing Casserole is one of those recipes that just takes me back to my mom’s kitchen table. The smell alone can transport me to my childhood home, and I love that my own kids have now learned to enjoy the meal, too! This dinner has become a regular meal in our house now as well, and I suppose that Lois has been making it for her children and grandchildren for almost 45 years at this point! With that kind of history, you know that the recipe is a keeper. I hope that you will add her Chicken and Stuffing Casserole to your collection as well! You can use the meat from a cooked rotisserie chicken or purchase cooked chicken at the grocery store for a shortcut. If you prefer to cook your chicken at home, I use 1.5-2 lbs. of raw chicken tenders (breast meat is fine too, but the tenders cook faster). My preferred cooking method is to place the chicken tenders in a baking dish. Drizzle with olive oil, season with salt and pepper, and toss to coat. Cover with foil and bake in a 400F (200C) oven for about 30 minutes (or until chicken is cooked through). Allow to cool before chopping and using in the recipe. Cooking Just for Two? You can either cut the ingredients in half and prepare the casserole in an 8-inch square baking dish; OR prepare the full recipe, but divide the ingredients between two 8-inch square baking dishes. Freeze the extra dish according to the instructions below for a later meal. Want to Prep Ahead? This casserole freezes well, so if you want to make it in advance, just prepare through step 5, wrap tightly, and place in freezer. When ready to eat, defrost and continue with Step 5. In a large bowl, whisk together condensed soups and milk. Stir in cooked chicken. Pour chicken mixture into prepared baking dish. In a separate bowl, pour melted butter over dry stuffing mix. Gently stir until all of the stuffing mix is coated with butter. Sprinkle over chicken mixture. Cover baking dish with foil. Bake, covered, at 350 degrees F for 20-30 minutes. Remove foil and bake for an additional 10-20 minutes, or until heated through and browned on top. f you prefer to cook your chicken at home, I use 1.5-2 lbs. of raw chicken tenders (breast meat is fine too, but the tenders cook faster). I made this last night and it was great! Next time I think I’m going to try adding some peas and carrots:) wonderful comfort for those cold evenings! 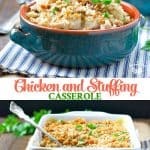 What can I serve as sides with the chicken stuffing casserole? Hi, Becky! I usually keep it simple with an easy vegetable side dish. Steamed broccoli, asparagus, a salad, roasted cauliflower, or peas are some of our favorites! I cannot get enough of this recipe. It has become s staple in my household. I usually buy chicken breast, boil them, and shred with my fingers. I don’t worry about the boiled chicken being tough because while baking with the soups it becomes very tender. Thanks for taking the time to post this wonderful recipe. Sweet potatoes, cabbage, green beans, potato salad, greens, zucchini and squash with onions. Corn on the cob or just plain corn. I have also used peas and a garden salad so it just depends on what you like best. It really goes with any veggie. Cranberry sauce ocean spray jellied is a nice little extra flavor or applesauce both served cold is easy. Hope this helps. Wow! Thanks for the idea – I have a can of cold cranberry sauce in fridge and we are making this dish tonight. I also added peas to the dish and some shredded sharp cheddar cheese before the stuffing! Thanks for the recipe and all the yummy add in ideas. Sounds like the perfect cozy meal for a cold night. Enjoy, Mia! Ditto on the peas and carrots. I’ll also add a small can of drained and sliced mushrooms, since my family and I love mushrooms in most of our casseroles. 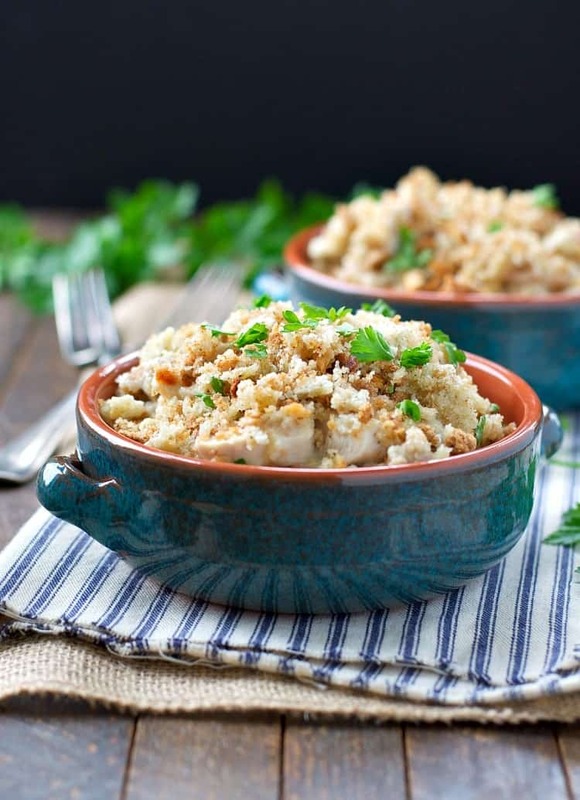 A sprinkle of garlic powder wouldn’t hurt this recipe one bit, and also some finely chopped fresh parsley…. but that’s a matter of personal preference. If I can find ‘lower sodium’ (or) ‘lower fat’ cans of’ soup, I’ll definitely use them…. instead of using the ‘regular’ soups (which are loaded with a lot of fat and sodium). I don’t think that these ‘minor’ adjustments will impart a huge alteration of the flavors in this dish, but that’s just my personal opinion. I’m sure this dish will be delicious, however you decide to prepare it. What method do you suggest for precooking the chicken? Would boiling it make the chicken too chewy? I have cheated both times I have made this devine recipe that my picky littles eat too!! I use the frozen bags of Tyson pulled or chunked chicken. Awesome eats both times. Thanks for sharing. That’s not cheating, Leslie! That’s just being efficient. 🙂 I use the Tyson cooked chicken in this recipe (and in other similar recipes) all the time. Glad that you enjoy it! I boil the chicken and season water with dehydrated onions and poultry seasoning, this give the chicken flavor. Yay! That’s great — so glad that you liked it, Anabelle!! As I was making this a few minutes ago I was thinking the same thing. Peas or peas and carrots would be great but for tonight they will have to be on the side unless they want to dump them in. Thank you for the recipe. I found this recipe today and it was awesome. I made a revision slightly to the receipe. I took casserole out of the oven after uncovering it and found the stuffing not crunchy as you stated. Reason being is because I added butter and broth to the stuffing mix. I simply stirred the topping in my chicken and soup mixture, placed it back in the oven for 25 additional minutes. While it cooked, I made some more stuffing mix with just the butter and then added it on top of my casserole. It was amazing. My husband wasn’t sure about it but he ate two plates. The recipe made alot. Thanks. Can you use cream of celery instead of the mushroom soup my son is allergic to mushrooms. Thanks can’t wait to try this. This dish is awesome!!! I could not believe how much flavor it has. The preparation is easy. Thanks so much, Theri Ann! Could this be done using boneless skinless thighs? Made the chicken and stuffing casserole for the first time last Sunday, and it was absolutely wonderful. I made it with boneless, skinless chicken thighs. My family is a total of six, and there nothing left. To me that says a lot. I’m making it again tomorrow. I know this recipe has been up awhile, but I just found it, and I’m confused about steps two and three. Two says to put the chicken in the casserole pan after it’s prepared, but three says to mix the chicken in with the sauce first. I’m going to try this one tonight, it sounds delicious. I think I’ll mix the chicken in with the sauce before putting it in the dish. Hah! You’re right — thanks for catching that mistake, KrisZ! The original recipe that I received at my bridal shower said to put the chicken in the dish first. I decided that it was easier to stir it all together first. Either way is fine, but I’ll update the recipe so that it’s not too confusing. 🙂 Hope you enjoy it! This is delicious! I’ve made one before but this recipe is so much better. I added carrots and corn, soooo good! My family is picky but it was a huge hit with everyone. Will definitely be making again!! Thanks so much!! If making with boneless, skinless chicken thighs , do you cook the meat before putting in the caserole? If so, what is the best method to cook them? Am anxious to try this recipe! Hi, Shirley! If you want to use the chicken thighs, you will still need to cook the meat before assembling the casserole. You can cook chicken thighs in a variety of ways, but one easy method is just to bake them in the oven. To do so, preheat oven to 375 degrees F. Place the chicken thighs in a baking dish, drizzle with a bit of oil, and season with salt and pepper on all sides. Bake chicken until completely cooked through to an internal temperature of 165 degrees F (about 30 minutes). Once the chicken is cooked, you can chop it or shred it and use it in the casserole as instructed. Enjoy! hi do I make the stuffing per box directions and then mix with butter? Or do I mix dry stuffing mix with butter?? Thank you! Hi, Aimee! Sorry that wasn’t more clear. 🙂 Just mix the dry stuffing with the butter. It will form a delicious crumb topping! Enjoy! Hi, Danielle! The top should definitely be crusty like any topping on a casserole. If the stuffing just below the top seems too dry or to crunchy, then it probably cooked too long. It should still be pretty moist below that first layer. I had the same problem. Don’t use the cubed stuffing. That would make it much better. This has quickly become a go-to recipe of mine. I love how simple and easy it is and so yummy. My family loved this! (I often boil chicken breast with salt, pepper and poultry seasoning to use in casseroles, and then use the broth in soups. I had four large breasts leftover from another dish we had this week, so I just chopped them up for this dish.) The only change I made to your delicious recipe was that I used a 14 oz. package of Arnold a Premium seasoned stuffing. I mixed one-half of the stuffing into the chicken/soup mixture along with a bit of the broth to moisten well, then I topped with the remaining stuffing/butter mixture per your recipe. My family says this recipe of yours is a keeper! Thank you for sharing. That’s awesome, Angie! I’m so glad that your family enjoyed the meal. Your changes sound perfect! Have you tried this with raw chicken? How about in a crock pot? Thx! I had a similar recipe years ago and can’t seem to find it. Came across your recipe and will definitely try it. My old recipe used broth instead of milk but your reviews are wonderful. Have you tried it with broth instead of milk and what are your thoughts on it? Thanks so much!! I thought the recipe was going to be too “soupy” when I prepped it, however after it baked and the stuffing topping had a chance to interact it came out perfect. I used an entire rotisserie chicken from the store (discard the skin as it can be a bit chewy and add greasy fat to the dish). Definitely add a can of mixed veggies…really put the dish over the top! Thanks for sharing Blair! Wonderful! I’m so glad that it was a hit, Cleo! That’s definitely one of my favorite comfort food dinners! Love your feedback and your twist with the veggies! I always panfry my chicken quickly on each side in butter, salt and pepper, add water, cover and boil slowly until tender. It adds so much flavor to the chicken. Since we’re from the South, I’m going to substitute the herb flavor stuffing and use the cornbread flavor. Does the casserole come out pretty moist? I can’t wait to try this!!! Hi, Diane! I’ve used the cornbread stuffing and it works great. This is definitely a moist casserole. 🙂 Enjoy! I made my own cream of chicken for this and added in some french cut green beans I also seasoned the chicken with a few more spices. It came out fabulous thanks for the idea my daughter loves it! My mom always made this exact recipe on Sundays from a super old cookbook she had. It’s always been a favorite of mine. To anyone who wants to make this but is trying to cut their saturated fat, you can use chicken broth to moisten the stuffing instead of the butter. The topping is still great and has much less fat. Just add enough chicken broth to make it slightly moist but not soggy. Hi, Nikki! 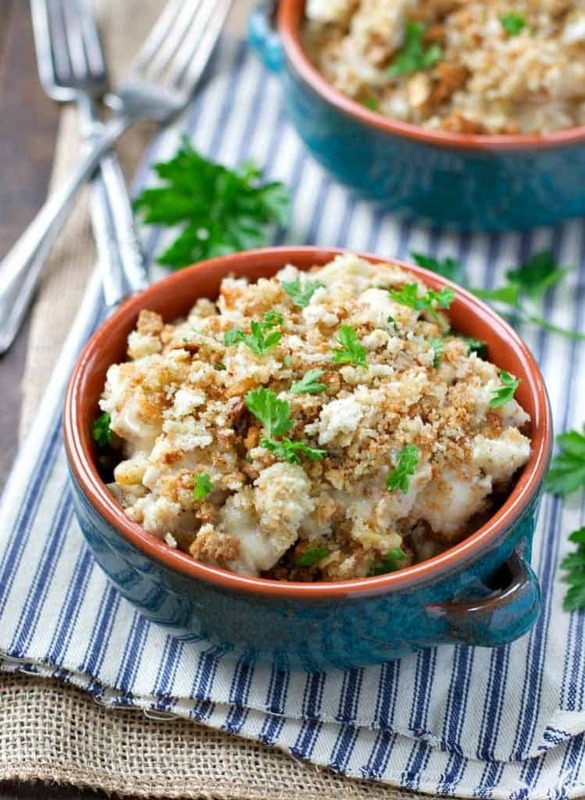 Aren’t old family comfort food recipes the best?! I love your suggestion to use chicken broth instead of butter. I’m totally trying that next time. Thank you!!! Nikki – Do you remember what cookbook it was? I am on the hunt to find the origin of this recipe as my mother was making this 40 years ago. She has it written on a card, but I was wondering if there was an origin, like Good Housekeeping or Better Homes and Garden, or a cookbook like you mentioned. I made this tonight and sauteed some onions and garlic in 1 stick of butter, I then added the mixture to the onions and garlic. I didn’t change the stuffing, although next time I might try a Ritz cracker! This was fantastic! Sounds perfect, Melissa! I’m so glad that you enjoyed it! This recipe is outrageously close to my mother’s recipe! Very delicious! For those not into cream of mushroom soup, cream of potato soup goes really well with this dish as well!! Thank you, and happy cooking! I made this using turkey breasts and served with cranberry sauce on the side. Quick and easy mini Thanksgiving about every two months! Thank you! Thank you! How far ahead can you prep this before baking? Or is it better to bake if you make it ahead of time and then re-heat later that day when you’re ready to eat? Delicious! !my husband and I loved it. Thank you! I made this tonight and I came out way soupy. I wish I had read the reviews beforehand. I ended up adding rice to it so help with the soupiness. That’s strange, Audrey. I’ve never had it come out soupy at all. Did you use JUST the condensed soup — not diluting it according to the can’s instructions? You don’t want to add any water to the dish — just use the undiluted soups and one cup of milk. The end result shouldn’t be soupy at all. Thank you for this recipe! My eight year old twin girls don’t like cheese (except for on pizza, and even then they may pick some off!) and so it’ can be challenging to find a good tasting casserole without cheese in it. This is perfect! I’ve been making this dish for years but I add sliced cheese to mine. I layer the cubed chicken at the bottom, add the sliced cheese on top, cover with cream of mushroom soup and cover with the stuffing! The cheese definitely makes it better!! The cheese sounds like a delicious addition, Angie! Thanks for that idea! This is so delicious! I did add some chopped onion and garlic to the soup mixture , but it would have been just as amazing without it.Thanks so much for this recipe! That’s great, Bree! Thanks for letting us know. So glad that you enjoyed it! It’s like a super easy chicken potpie with extra flavor from the stuffing mix. I loved it. So glad that you enjoyed it, Nina! Hey Seria! You definitely want to cover the dish so that the topping doesn’t burn, but you don’t have to use foil. Do you have a different oven-safe cover that you can use on your dish instead? A dish with a lid, parchment, or maybe even just a sheet pan? Sounds delicious! Will make tonight. Is it possible to add rice? Hey, Krissy! Yes, I think you could definitely add some cooked rice to the dish! My husband and I love these kinds of recipes. I followed your recipe to a tee, using condensed soups and did not thin them at all. The stuffing was really hard, not fluffy at all. I added peas to it as well for veggies. I’ll try less liquid next time, maybe one can of soup instead of two or no milk. Fingers crossed! Would this still be good if cauliflower and carrots are mixed in? Hi, Kirst! I haven’t done that myself, but I’m sure it would still be great! Just make sure that your vegetables are small enough to cook in that amount of time (so that you don’t have crunchy vegetables at the end) OR parboil the vegetables first so that they have a bit of a head start. Can I just mix everything together? This recepie is a keeper as is. It is delicious. We loved it and my husband is very picky. I made peas and roated cauliflower on the side. Thank you so much for this recepie!!!!!! Thank you for this recipe! I by no means want to step on toes here but I thought I would add what I have done to make this fabulous recipe a bit different for my family. We aren’t fans of frozen or precooked chicken so I use my InstantPot to cook 2 boneless skinless breasts which cuts cooking time and eliminates heating up my kitchen. I also use my electric mixer to shred the chicken after its cooked to save my hands from cramping. I use some of the broth in my InstantPot (about 1 tablespoon) to add to the butter for the stuffing mix and I also add in whatever vegetables I have on hand to make this a complete meal. Other than that, I keep the recipe as you do. My kids love this and so do I! Sounds like real comfort food especially this time of year. Going to make after Thanksgiving, also nice way to use up leftover turkey. When I need to cook chicken 🐔 for a recipe I cook it in the microwave. Just put it in a glass pie plate or a glass baking dish and I cover it with a microwave dome cover and cook for about 8 to 10 Minutes (more or less if needed, depending on thickness of chicken), then cut up or shred. I used to boil it years ago, then someone told me about the microwave and it is so much easier and less cleanup. I also do this with chicken and sausages that are going on the grill, this way they don’t get stringy and dry or burn to a crisp on the grill, people always comment at my BBQ’S at how moist my chicken and sausages are..
Did I do something wrong? The stuffing came out crunch like tiny little croutons vs moist and fluffy like stuffing. Made this last night and it was awesome (I don’t know how other peoples’ came out soupy). As others have suggested, I am definitely adding some frozen mixed vegetables to the dish next time – but some seasoned corn on the side was also perfect. Even without adding any extra seasonings this dish had a ton of flavor! Another recipe to add to my collection. Thank you, Blair. Hope you and your fam have a great weekend! That’s great, Alyssa! I’m so glad that you liked it! 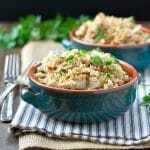 Can someone please help me out with the sauce ratios, as I am trying to make a vegan version of this recipe and make my cream of chik’n soup from scratch. When the milk is mixed with the both cans of soup, how many cups of sauce does it measure out to? My math is saying just over 3 1/2 cups, but want to make sure the cans don’t blend to a different ratio. Hate to have it extra soggy or dry. TIA!! Each can of condensed soup is 1.25 cups. So you need a total of 2.5 cups of condensed soup before you add the milk and melted butter. Enjoy! Thanks! Challenge excepted! It’s much easier than you think. Can’t wait to try it! Can you use chicken gravy? Hey, Holly! Yes, you probably could add it to the dish. Maybe in lieu of one of the cream soups? Or you could use it as a garnish and drizzle with gravy just before serving. This is amazing with Turkey. I just switch out the chicken and everyone goes nuts over it! When I was walking down the soup aisle for my cream of chicken, a can of cream of bacon hit my eye. I used those two soups and added a cup of chopped cooked bacon. Chicken bacon stuffing. SO YUMMY!!! Thank you for this wonderful starter! I have been making a similar casserole since college. I use shredded chicken and cream of celery, instead of the mushroom soup. I layer the stuffing and chicken. Mix the two soups. Poke holes in the chicken/stuffing with a wooden spoon and pour the soup mixture over the top.Of course, the chicken is cooked and the stuffing is mixed, according to the package. I make this when I’m running short of time and it’s always “lick the dish” gone. 🙂 I serve it with mashed potatoes and a green vegetable. Thanks for sharing your wonderful recipe. It’s great to see people can still cook! 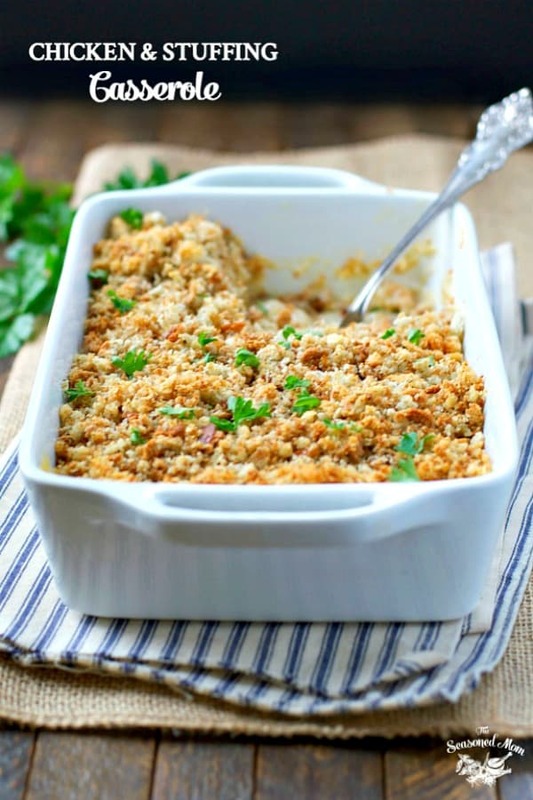 My hubby and I love this casserole. I added roasted asparagus and fresh corn. It is delicious. There are just the two of us so I freeze some for more than one meal.